At the foundation of the LabLynx Informatics Platform is our dedicated, purpose-built LabLynx Cloud Infrastructure as a Service (IaaS). It has been designed and built from the ground up using only the finest hardware and software components, using best practices and ensuring comprehensive redundancy, failover, data backup and protection and SSL security and encryption. The LabLynx Cloud Infrastructure is housed in a state-of-the-art data center, certified to the highest SSAE SOC 2 standards so that together, our cloud-hosting infrastructure and premises offer you a 99.9% uptime guarantee. Database backups are taken hourly, and entire backups are done daily and stored in a geographically distant second data center. In short, no one offers better reliability and data security and protection than LabLynx. Despite the feeling of some that data must be housed onsite, the truth is that your data and application are almost certainly more secure, with more uptime availability, than any in-house IT department. Think of it this way: you go online with your PC, laptop or cell phone all the time. The biggest difference between certified cloud-hosting data centers and you is that the data center was custom-designed and continually monitored to be the most secure data repository possible. The reason people use banks is because they are specifically designed to protect your money, while making it available to you in the most convenient ways possible. Millions trust online banking every day. Many of our customers require HIPAA, CLIA or other regulatory compliance, and the LabLynx Cloud Infrastructure IaaS cloud platform delivers that and more. And your data belong to you. Anytime you want a separate copy of the latest, we provide it to you. There are some good reasons why Cloud Computing has become the biggest trend in data management since the advent of the Internet. Like the early days of automobiles when you had to be a mechanic to own a car, it’s no longer necessary to have your own IT department in order to use apps and manage data. LabLynx recognized cloud computing’s importance early on, and because of that was able to get a big head start on other companies in the laboratory, science and healthcare informatics sector. Weled the way by discovering and implementing best practices and constructing the most reliable and secure Cloud Infrastructure available to the community. And because it is ours, not rented from Amazon, Rackspace or anyone else, we can guarantee maintenance, performance and correct installation, and all at a lower price. Agility improves with users’ ability to re-provision technological infrastructure resources. Cost reductions claimed by cloud providers. A public-cloud delivery model converts capital expenditure to operational expenditure. This purportedly lowers barriers to entry, as infrastructure is typically provided by a third party and need not be purchased for one-time or infrequent intensive computing tasks. Pricing on a utility computing basis is fine-grained, with usage-based options and fewer IT skills are required for implementation (in-house). The e-FISCAL project’s state-of-the-art repository contains several articles looking into cost aspects in more detail, most of them concluding that costs savings depend on the type of activities supported and the type of infrastructure available in-house. Device and location independence enable users to access systems using a web browser regardless of their location or what device they use (e.g., PC, mobile phone). As infrastructure is off-site (typically provided by a third-party) and accessed via the Internet, users can connect from anywhere. Maintenance of cloud computing applications is easier, because they do not need to be installed on each user’s computer and can be accessed from different places. utilization and efficiency improvements for systems that are often only 10–20% utilised. Performance is monitored, and consistent and loosely coupled architectures are constructed using web services as the system interface. Productivity may be increased when multiple users can work on the same data simultaneously, rather than waiting for it to be saved and emailed. Time may be saved as information does not need to be re-entered when fields are matched, nor do users need to install application software upgrades to their computer. Reliability improves with the use of multiple redundant sites, which makes well-designed cloud computing suitable for business continuity and disaster recovery. Scalability and elasticity via dynamic (“on-demand”) provisioning of resources on a fine-grained, self-service basis in near real-time (Note, the VM startup time varies by VM type, location, OS and cloud providers), without users having to engineer for peak loads. This gives the ability to scale up when the usage need increases or down if resources are not being used. Security can improve due to centralization of data, increased security-focused resources, etc., but concerns can persist about loss of control over certain sensitive data, and the lack of security for stored kernels. Security is often as good as or better than other traditional systems, in part because providers are able to devote resources to solving security issues that many customers cannot afford to tackle. On-demand self-service. A consumer can unilaterally provision computing capabilities, such as server time and network storage, as needed automatically without requiring human interaction with each service provider. Broad network access. Capabilities are available over the network and accessed through standard mechanisms that promote use by heterogeneous thin or thick client platforms (e.g., mobile phones, tablets, laptops, and workstations). Resource pooling. The provider’s computing resources are pooled to serve multiple consumers using a multi-tenant model, with different physical and virtual resources dynamically assigned and reassigned according to consumer demand. Rapid elasticity. Capabilities can be elastically provisioned and released, in some cases automatically, to scale rapidly outward and inward commensurate with demand. To the consumer, the capabilities available for provisioning often appear unlimited and can be appropriated in any quantity at any time. Measured service. Cloud systems automatically control and optimize resource use by leveraging a metering capability at some level of abstraction appropriate to the type of service (e.g., storage, processing, bandwidth, and active user accounts). Resource usage can be monitored, controlled, and reported, providing transparency for both the provider and consumer of the utilized service. ↑ “Recession Is Good For Cloud Computing Microsoft Agrees”. CloudAve. http://www.cloudave.com/link/recession-is-good-for-cloud-computing-microsoft-agrees. Retrieved 2010-08-22. 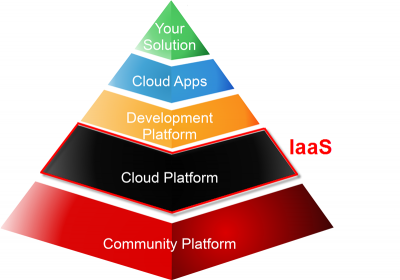 ↑ 2.0 2.1 2.2 “Defining ‘Cloud Services’ and “Cloud Computing””. IDC. 2008-09-23. http://blogs.idc.com/ie/?p=190. Retrieved 2010-08-22. ↑ “e-FISCAL project state of the art repository”. http://www.efiscal.eu/state-of-the-art. ↑ Farber, Dan (2008-06-25). “The new geek chic: Data centers”. . http://news.cnet.com/8301-13953_3-9977049-80.html. Retrieved 2010-08-22. ↑ “Jeff Bezos’ Risky Bet”. Business Week. http://www.businessweek.com/magazine/content/06_46/b4009001.htm. ↑ He, Sijin; Guo, L.; Guo, Y.; Ghanem, M.. Improving Resource Utilisation in the Cloud Environment Using Multivariate Probabilistic Models. 2012 2012 IEEE 5th International Conference on Cloud Computing (CLOUD). pp. 574–581. doi:10.1109/CLOUD.2012.66. ISBN 978-1-4673-2892-0. http://ieeexplore.ieee.org/xpls/abs_all.jsp?arnumber=6253553. ↑ He, Qiang, et al. “Formulating Cost-Effective Monitoring Strategies for Service-based Systems.” (2013): 1-1. ↑ (23 May 2013). Xero For Dummies. John Wiley & Sons. pp. 37–. ISBN 978-1-118-57252-8. https://books.google.com/books?id=drOF19aBKfgC&pg=PT37. ↑ King, Rachael (2008-08-04). “Cloud Computing: Small Companies Take Flight”. Bloomberg BusinessWeek. http://www.businessweek.com/technology/content/aug2008/tc2008083_619516.htm. Retrieved 2010-08-22. ↑ 11.0 11.1 Mao, Ming; M. Humphrey (2012). “A Performance Study on the VM Startup Time in the Cloud”. Proceedings of 2012 IEEE 5th International Conference on Cloud Computing (Cloud2012): 423. doi:10.1109/CLOUD.2012.103. ISBN 978-1-4673-2892-0. http://ieeexplore.ieee.org/stamp/stamp.jsp?tp=&arnumber=6253534&isnumber=6253471. ↑ “Defining and Measuring Cloud Elasticity”. KIT Software Quality Departement. http://digbib.ubka.uni-karlsruhe.de/volltexte/1000023476. Retrieved 13 August 2011. ↑ “Economies of Cloud Scale Infrastructure”. Cloud Slam 2011. https://www.youtube.com/watch?v=nfDsY3f4nVI. Retrieved 13 May 2011. ↑ He, Sijin; L. Guo; Y. Guo; C. Wu; M. Ghanem; R. Han. Elastic Application Container: A Lightweight Approach for Cloud Resource Provisioning. 2012 IEEE 26th International Conference on Advanced Information Networking and Applications (AINA). pp. 15–22. doi:10.1109/AINA.2012.74. ISBN 978-1-4673-0714-7. http://ieeexplore.ieee.org/xpls/abs_all.jsp?arnumber=6184989. ↑ Marston, Sean; Li, Zhi; Bandyopadhyay, Subhajyoti; Zhang, Juheng; Ghalsasi, Anand (2011-04-01). “Cloud computing — The business perspective”. Decision Support Systems 51 (1): 176–189. doi:10.1016/j.dss.2010.12.006. http://www.sciencedirect.com/science/article/pii/S0167923610002393. ↑ Mills, Elinor (2009-01-27). “Cloud computing security forecast: Clear skies”. CNET News. http://news.cnet.com/8301-1009_3-10150569-83.html. Retrieved 2010-08-22.